The U.S. Army just got a new tank. But you wouldn’t know it from the way the ground-combat branch describes the vehicle. On Oct. 4, 2017, the Army’s program office for ground vehicles announced that the service had accepted the first M-1A2SEPV3 “on schedule and on budget.” General Dynamics Land Systems builds the tank in Lima, Ohio, using existing M-1 hulls as a starting point. The Army asked to buy 56 M-1A2SEPV3 tanks in 2018, against a total requirement for around a thousand of the new vehicles — enough to equip all of the branch’s active-duty tank brigades. At present, a V3 costs around $20 million. The price should drop as the production rate increases. 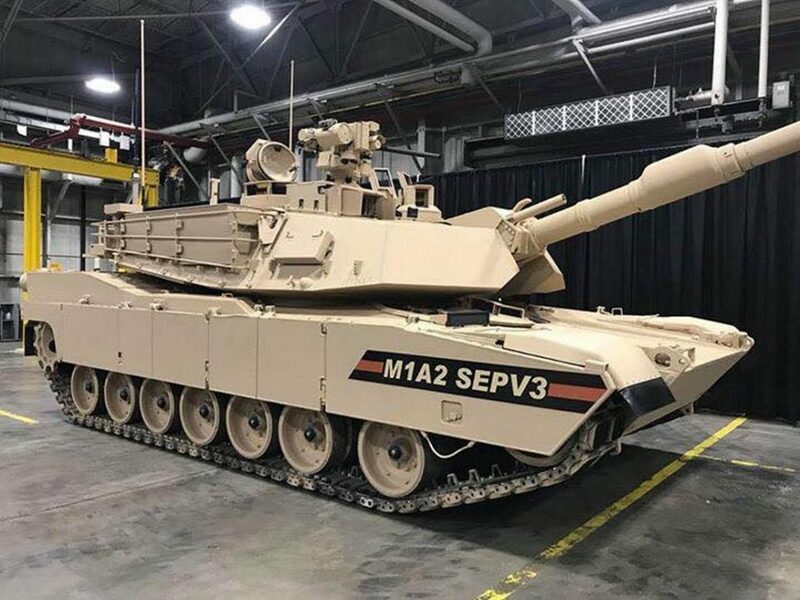 While officially a variant of the nearly four-decade-old M-1 tank, the SEPV3 is, in all the ways that matter, essentially brand new. The preceding variant, the M-1A2SEPV2, entered service in 2007. “Principal improvements are in lethality, survivability and sustainability,” Don Kotchman, a General Dynamics vice president, said in late 2015. The M-1A2SEPV3 boasts improved inertial navigation to achieve what Kotchman described as “better round dispersement” — in other words, improved main-gun accuracy. There’s also a data-link for programmable munitions, making the SEPV3 compatible with new, “smart” cannon rounds that are beginning to enter the Army’s arsenal. The V3 tank also has tougher front and rear armor than the V2 does — plus a built-in jammer for defeating radio-triggered improvised explosive devices. Some of the most important improvements are seemingly the most boring. The V3 comes with a new auxiliary power unit installed underneath the armor. This APU allows a tank crew to power their vehicle’s electronics without turning on the main engine. That way, a tank can quietly and efficiently monitor the battlefield for hours at a time without guzzling a full tank of gas. Kotchman said the power unit makes the new tank a third more fuel-efficient compared to earlier variants. The V3 features a 1,000-amp generator that Kotchman said would be able to power the new digital radios that the Pentagon is developing. To support the radios’ digital datalinks, the V3 has an ethernet architecture and better line-replaceable units — in essence, black boxes for computer motherboards. The V3 does not come with a new engine. The Army decided against replacing the M-1’s gas turbine with a more efficient diesel engine. “Right now, as the Army balances priorities, there doesn’t appear to be interest,” Kotchman said. Likewise, the V3 has the same 70-ton suspension that the V2 does. Kotchman said the SEPV3 is still under 70 tons, but could grow heavier with future upgrades. “We’re looking at future opportunities for potential suspension upgrades,” he said. Even though it shares the engine, suspension, main armament and basic layout of the older M-1A2SEPV2, the V3 is a much harder-hitting and better-defended tank with a new power system and network architecture. Fifty years ago, the Army might have given a vehicle with so many new features a new designation — at the very least, referring to it as the M-1A3. But in recent decades, the military has preferred to downplay many of its technological advancements. Sometimes, the name game represents an effort to avoid Congressional and taxpayer scrutiny. In the early 1990s, the Navy was stinging from its failed effort to develop a brand-new stealth fighter-bomber called the A-12. So when the sailing branch tapped Boeing to supply a new fighter to replace the A through D models of the F/A-18, it insisted on calling the new jet the F/A-18E/F. Never mind that the latter has a larger and aerodynamically-distinct airframe and wing, new engines, a new radar and a greatly improved cockpit compared to the original F/A-18. By the same token, as long as the Army continues to produce new tanks under the M-1 appellation, it can argue to Congress and taxpayers that it’s still using 40-year-old tanks — and needs more money to acquire something new. In fact, the M-1A2SEPV3 is new. Even if it looks like a 40-year-old tank … and shares its name.